Taking place in Paris, May 24-26, one of the world’s biggest conferences for startups & leaders offers a chance to meet and collaborate with executives in your industry, develop partnerships with booming startups, and connect with top investors to raise funds. 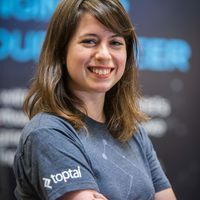 Iva Touzimska, Technical Recruiter at Toptal, will give a talk titled Right Person / Right Job? where she will explain how hiring the wrong person can cost your startup money, and waste your time. She will also give some tips how to manage risk when recruiting new employees, and give insights from employers who made their dream team a reality.